Issue: While adding V3700 or V7000 or any SVC controller Array Manager (SRA) to VMware Site Recovery Manager (SRM), you get following error message. 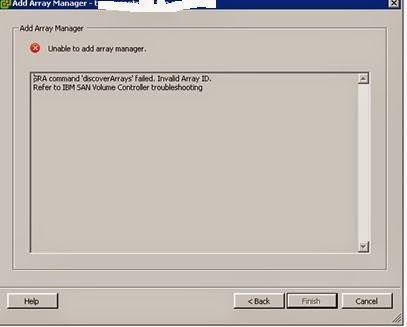 Solution : You get this error message if you didn’t run "IBMSVCSRAUtil" as per IBM documentation. This helps to test remote site replicated Mdisk. 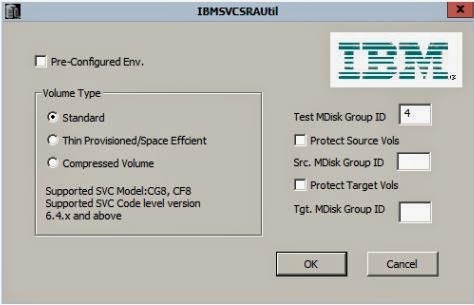 Open IBMSVCSRAUtil from Start – Programs- IBM Corporation –Launch IBMSVCSRAUtil.exe ( As administrator) – if you don’t run as administrator, IBMSVCSRAUtil window will not be closed after entering Mdisk number and press OK. Perform above steps at both Protected and Recovery site. 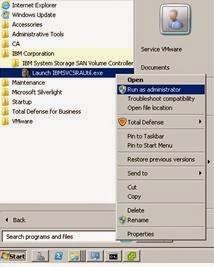 After this step, go back to “Add Array Manager” and enter details. This time you will be able to add IBM Storage array.